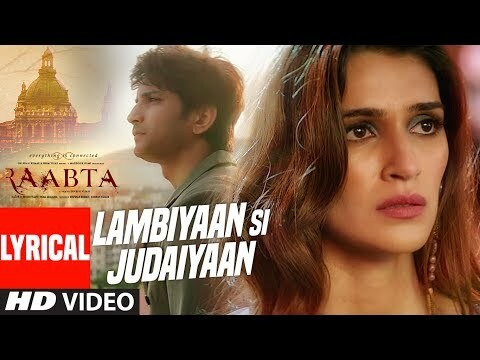 Gulshan Kumar and Prem Vijan present "Lambiyan Si Judaiyan" video with Lyrics in the voice of Arijit Singh composed by JAM 8 and penned by Amitabh Bhattacharya from the upcoming Indian film "Raabta" a film by Dinesh Vijan and Produced by Dinesh Vijan Homi Adajania Bhushan Kumar Krishan Kumar.The Film stars Sushant Singh Rajput and Kriti Sanon in lead roles. The Film releases on 9th June. Music Programming - Prasad Sashte, Sourav Roy. Mixed and Master by - Eric Pillai (Future sound of Bombay). Production Manager- Anupam Amod, Manoj Harsh. Acoustic Guitars - Arijit Singh and Roland Fernandes.